In the petrochemical industry and process industry, Corrosion under Insulation, also referred to as CUI, is an extremely important phenomenon. Corrosion under Insulation is one of the most common and extensive failure mechanisms in the petrochemical and process industry. This type of failure can lead to abrupt system breakdowns, high maintenance costs and unplanned stoppages of essential assets. Corrosion under insulation takes place within a specific temperature range where a highly aggressive environment forms between the process pipe and/or structure and the insulation cladding. Serious corrosion can spread extremely quickly under these circumstances. 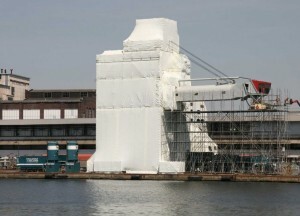 Cuijpers Services BV has extensive experience in successfully completing Corrosion under Insulation projects. In consultation with our customers, we determine the scope and actions that are required, coordinate the work with other relevant contract activities such as scaffolding erection, insulation fitting, installation of trace heating and engineering work to a tight schedule, choose the type of corrosion protection method that needs to be used for each project or system and determine a final deadline. The corrosion protection method may be conventional abrasive blasting and painting, or TSA, TSZ and even tape.